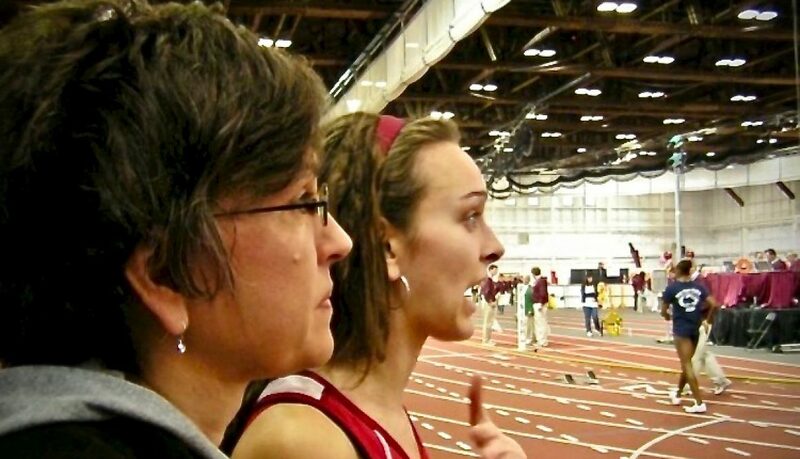 Over a decade later, stories are still coming out of the women’s 600-meter dash at the 2008 Big Ten Indoor Track and Field Championships, where Heather Kampf (née Dorniden) shocked everyone. “Oh no,” Heather Kampf says. She says it calmly. Too calmly for someone falling to the ground in the middle of a conference championship race. But that calmness is why things are about work out the way they will. She gets up in an instant, like the fall was all just part of the plan to fit a burpee into her race, shooting off the ground like Flo-Jo exploding from the blocks. The three other runners have distanced themselves, but to Kampf, they are still in reach. So, she begins chasing them. The lead shrinks slowly at first, but with each step she picks up steam. A combination of fitness and rising confidence seem to buoy her. Like an avalanche growing in strength, Kampf keeps upping the pace as she inches closer to Dorr—who is faltering after nearly falling during the trip-up with Kampf. She blows past Dorr with 100-meters to go, but it still seems unlikely she will be able to catch the leaders. The crescendo will not abate, however. Around the turn, Kampf continues to move faster, her back arching as if it can’t quite control the flood of speed. And she continues to reel in the field, even if it still seems impossible that she’ll catch the final two runners in the last 50 meters, when the track straightens out. The final straight is a rush—Kampf simply swallows up the field. She goes by the runner from Indiana with less than 15 meters left and finds herself in second. Then it’s one final push, and she blitzes past her teammate in the final steps, crossing the finish line to take the race. What happens next is no surprise. The Internet, while not quite as fast as it will be in 2019, moves quickly. Kampf’s race goes viral. A combination of clickbait—“This inspiring runner took a nasty fall, but she didn’t stay down for long”—and inspiration make for the perfect online clip. It remains so today: On January 9, Cracks, a Spanish-language sports media company, posted the video on its Facebook page—where it garnered over one-thousand likes. Over eleven years later, the video and the race still resonate. But, as is the case with every race, there is more than one story to be told. And, as is the case with many a viral video, there is more to the story than what is captured in the frame. “It’s funny because I absolutely hate it,” Fawn Dorr says. “I hate it so much.” She is, of course, talking about seeing the video of the race. Sure, it’s an amazing performance, she knows, but who wants to be reminded of a race where they’re involved in a fall? Especially one where they end up finishing last? And she is reminded. People still post the video to her Facebook page. Dorr is retired from professional running now, but she had a successful career, making multiple national-team appearances for Canada after a storied stint at Penn State University. On the track, she was brash. Her pre-race stare was piercing, and she competed with energy, which often came through in yells and roars at the starts or ends of races. In 2008, Dorr was running her first Big Ten Championship meet for Penn State. She was more of a sprinter—her specialty was the 400-meter hurdles—but this was the conference meet, and athletes were taken out of their comfort zones for the good of the team. This meant Dorr was going to have to be flexible. Team is the key word when it comes to a college conference meet. Whether it’s the Big Ten, Pac-12, S.E.C., or A.C.C., conference meets are circled on the calendar each year for collegiate teams as the meet. Winning the N.C.A.A. team title is nearly impossible for most programs, but pulling together enough points to win a conference meet is much more attainable. Plus, most athletic departments and athletic directors place a priority on winning conference championships—including the practice of sprinkling monetary bonuses for a conference title into a coach’s contract—and that culture is passed down to the coaches and athletes. Runners, throwers, and jumpers alike get excited for the meet, often competing in more than one event to maximize points. Add in the rowdiness of crowds—especially indoors, where spectators bear down on the track—and bragging rights, and a conference meet is track and field at its best. And the 2008 Big Ten Indoor Track and Field Championship at the University of Minnesota Fieldhouse was no different. The atmosphere was electric, and athletes were doubling and tripling to bring home as many points as possible in the team race. Penn State was in the mix for a Big Ten title, so Dorr was running the 400 and the 600 meters. Minnesota had a heck of a team, too—and they were on their home track. Heather Kampf was one of many Gophers in more than one event, entering the mile, the 600 meters, and the 4 x 400-meter relay. Kampf was already the school’s most decorated runner. As a freshman, she had won the indoor N.C.A.A. title at 800 meters, becoming the school’s first national champion. By the time she graduated, she was an eight-time All-American and owned ten school records. But the first weekend of March in 2008, none of that mattered. She was simply running for as many points as possible. Minnesota was the defending champions, but winning at home would make it extra sweet. Doubling was no easy task, however. At that point, the men’s and women’s events were held in different locations. With no men’s 60 meters or 5,000 meters held before or after the women’s version of each race, there was less time between events—which, in turn, meant there was less time to rest. But this was conference. And it was at home. There was no time to worry about rest. The day before, she had taken care of business in the prelims of the mile—finishing second in an automatic qualifying spot with a run of 4 minutes, 48.18 seconds—and the 600—winning her heat in 1 minute, 29.65 seconds, the fastest time of the day. Sunday would be a different beast, though. The mile field was stacked, with a slew of talented runners like Nicole Edwards of Michigan, Angela Bizzarri of Illinois, and a future Olympic Gold Medalist in the triathlon, Gwen Jorgensen of Wisconsin. Kampf, who knew the mile was in her future (today, calling her the queen of the road mile is no stretch), stuck her nose in it. Edwards proved too strong for Kampf and the rest of the field, and ran away with the race, running 4 minutes, 41.04 seconds to win by over two seconds. Kampf finished fourth in 4 minutes, 44.26 seconds. That meant five valuable points in the team score. She only had about forty-five minutes until the 600 final. She went out into the Minnesota cold and did a cool-down and a warm-up all in one. Dorr, meanwhile, had qualified for both the finals of the 400 and 600, and had won the “slow” heat of the 400 to take fourth place in the event, bringing in five valuable points. The “slow” heat is common in indoor conference meets. Because eight athletes score at the Big Ten meet, there needs to be at least eight runners in the final (the Big Ten takes nine runners through, so one unlucky runner will leave the final without scoring a point). But because most indoor tracks only have six lanes, a final is run in two heats. At the Big Ten meet, the first—“slow heat”—would have five, and the second heat would have four. The times from both heats are combined for the final score. If, by chance, a runner wins the first heat in a faster time than the second heat, that time would stand as the winner. Dorr ran faster than one runner from the fast heat of the 400, thus her fourth-place finish. She wouldn’t be in the slow heat of the 600, though. And that was important, the team race was turning into a three-team battle between Minnesota, Michigan, and Penn State. Dorr needed all the points she could get. Like the mile, the 600 was loaded. Along with Kampf and Dorr, Molly Beckwith, Indiana’s star half-miler who would eventually run 1 minute, 57.68 seconds for 800 meters, and Minnesota’s Jamie Ditmar were fit and ready to roll. After Audrey Smoot won the slow heat in 1 minute, 31.59 seconds, the second heat lined up. The final four finalists of the 600 stood in their lanes and waited for the gun. Dorr ran hard from the first step, gliding through the first two turns and moving with determination into the lead. Kampf was close on her heels as they came through the first 200 meters in just under 29 seconds. Beckwith had let a small gap form between her and Kampf, and Ditmar was just behind in fourth. Dorr continued to lead through the next lap, but slowed ever so slightly. Kampf could feel the pace lag, so moved onto Dorr’s shoulder around the turn. Beckwith and Ditmar inched closer, too, as the pack of four hit the homestretch of the penultimate lap. As the turn straightened out, Kampf moved to the outside and began to pass Dorr. But Dorr wasn’t going to give up the rail easily—that wasn’t her M.O., she always raced aggressively. She pushed harder, hoping to hold off Kampf. But that’s when Kampf moved inside—which is when Kampf fell. Beth Alford-Sullivan was on the backstretch. She was at the point just after the first turn and had a perfect view of the start/finish line. At the time, she was the director of Penn State’s track and field program hoping for a heroic performance from Dorr. Then she saw Kampf fall face-first into the track. Dorr reacted quickly, jumping over the falling Kampf and led the field into the final lap as the bell rung. Coming through in just under 60 seconds, Kampf’s fall took Dorr out of her rhythm. She was already tired from the 400, and having to hurdle a competitor didn’t help. Ditmar went by her with 180 meters left, and Beckwith was by her quickly, too. Kampf, meanwhile, was up almost as quickly as she had gone down. The way she remembers it, she has no recollection of going down—only that her hands had kept her from falling and had pushed her up so she was running again in an instant. She didn’t quite understand how everyone had gotten so far ahead of her in such a short time, but she does remember the noise. “Everybody went, ‘Ohhhhh,’” Emily Langenberg, a Michigan State runner who was watching that day, says. “The place went crazy,” Alford-Sullivan says. The beauty of indoor track and field is its intimacy. Sure, the Olympic stadium when Australian Cathy Freeman won gold in Sydney in 2000 was electric, but being packed inside a fieldhouse with over one thousand fans and athletes at a conference meet is its own kind of crazy. When Kampf started reeling in Dorr, Beckwith, and Ditmar, the roar inside the University of Minnesota Fieldhouse was palpable—and it only rose as the final lap unfolded. Alford-Sullivan laughs looking back on it. She was a Minnesota grad, so had mixed feelings throughout the last 30 seconds of the race. After the initial bit of joy she had felt that the top Minnesota runner was likely to end up out of the scoring, her mindset turned quickly. She wasn’t alone. Like Kampf’s pace, the noise kept growing. And it was, indeed, cool. As we all know now, she ran past Beckwith and Ditmar in the final straight and into history. In the moment, she didn’t realize just how crazy the accomplishment was. She knew it was special, but it wasn’t until she watched the video that she knew how bad of a fall she had taken. She has a theory why she doesn’t remember the actual fall. “Belief is so powerful,” she says. The immediate aftermath was of shock and awe. No one could believe what they had just seen. Kampf had fallen on her bike earlier that week, and had cuts on her knees—so it looked like the fall was even worse than it was. Her coaches and teammates hugged her and congratulated her. She didn’t have much time, however. After what was perhaps the greatest race in Big Ten history, Kampf needed to get ready for the 4 x 400-meter relay. Her team was still in the mix for a team title, thanks to her heroics in the 600. There wasn’t a person in the stadium who could believe what they’d seen. But there was one more thing Alford-Sullivan had to consider: She was the Penn State coach. And as far as Penn State fans and athletes were concerned, Kampf had cut in early, no matter if it was the greatest thing they’d seen on a track. So that’s how it came to be that Heather Kampf was almost disqualified from the race that remains an internet sensation today. After some mental gymnastics in her own head about whether to do it or not, Alford-Sullivan officially filed a protest. She walked up to a race official she had known since the eighth grade, and told him she thought that Kampf had cut in early, and that she’d like an official review—and yes, she knew how amazing of a race it was. But it was the right thing to do, she knew. It was a tight call, Kampf was moving in, and Penn State was in a tight battle for the team title. Dorr, meanwhile, had finished out of the scoring, and if Kampf was out, it would mean less points for Minnesota while tallying one more onto the Penn State score. So, Alford-Sullivan filed a protest. The officials didn’t have the technology then that they do now. There was no hi-tech, slo-mo replay to see if Kampf had cut in too soon, and nothing to go by other than what the officials remembered seeing. In the end, they decided there was not enough evidence to disqualify Kampf. Kampf would go on to help Minnesota take third in the 4 x 400, too, and Minnesota would win the meet by eight points over Michigan. Penn State finished in third, fifteen points back of the Gophers. Not only had Kampf gotten up from a fall, it was the points from that race that carried Minnesota to the team title. That part rarely makes the viral video. Everyone knows Kampf pulled off the impossible, but they don’t necessarily know her heroics helped Minnesota win the 2008 Big Ten Championship. There’s one more detail that is not so well known. In fact, it’s something that came as a surprise to Kampf, too. Because of the tight schedule of races, meet officials were unable to hand out awards for many of the races that took place throughout the day on March 2. So, once the 4 x 400 concluded, the women were asked to stick around for multiple awards ceremonies. The Minnesota women knew they had won the meet, and, as the runners gathered around to receive their medals for the 600 meters, the Gopher faithful were ready to show Kampf their appreciation. Kampf lined up behind the top position on the podium—the place reserved for the winner. But someone else was standing there, too: A runner from Indiana, who seemed to want to say something to her. It seemed weird that someone would be standing in her spot. Hadn’t she seen Kampf cross the finish line in first? In fact, it was a little awkward. Then, all of a sudden, Kampf remembered the slow heat. She could swear she heard the announcer say after the race that she was the Big Ten champ in the 600 meters. There was no way she hadn’t won the thing, was there? Audrey Smoot had a good feeling about that weekend. That’s why she urged her parents to go to Minneapolis on March 1 and 2 in 2008. It was going to be good, she told them. It would be worth the ten-hour drive, she said. It was her goal to make the final of the 600 meters at the Big Ten meet, and she wanted her parents, Mark and Diane Smoot, to be there if, and when, she did. So, Mark and Diane drove all the way up to Minnesota to watch their daughter run. Smoot was a 20-year-old junior at Indiana University then. Today, she works in legal and compliance for a broker dealer in downtown Indianapolis, but, as she says, she remembers March 2, 2008 better than she remembers yesterday. Despite having a good feeling about the weekend, the prelim did not go to plan. “I had a bad race,” she says. “I felt terrible.” Fortunately for Smoot, she was able to win her heat, which meant she automatically qualified through to Sunday’s final. Her time of 1 minute 33.95 seconds was the slowest time to make it through the heats, so she was going to be in the first heat as the ninth seed. That was fine for Smoot, who was relieved to have achieved her goal of making the final. Same went for her parents, whose ten-hour drive was going to at least be for two races instead of only one. It was time for a new goal, though, so Smoot came up with a race plan for Sunday: “I only have to beat one person, and I can score at Big Tens,” she thought. She barely slept that night, twisting and turning thinking about the race. But when she woke up, her legs felt amazing, better than they had maybe ever felt. She started thinking that, not only could she maybe score a point, but maybe she could run a personal best. She knew the five runners in her heat and came up with a plan to finish in at least fourth to secure that sought-after point. Penn State senior Brienne Simmons and Ohio State senior Chandra Krempel were runners that Smoot was unlikely to beat—they were both perennial Big Ten scorers—but she decided to key off them to run her best race. So, when the gun went off, she settled in behind the two of them, who she figured and hoped would go out too quickly. Smoot says Simmons and Kremple came through 400 meters in about 56 or 57 seconds. She was in third and felt pretty good. Then, “They started to kinda die, I guess,” Smoot says. She also PR’d. That feeling she had before the weekend? It turned out to be pretty spot on. She found her parents by the finish line to watch the fast heat. Maybe she could even sneak in front of a runner or two from the second heat and finish higher than fifth, they thought. She was amazed by the race and by the roar of the crowd. She couldn’t believe what she had just seen, Kampf had just fallen down, gotten up, and won the Big Ten 600 meters. At least that’s what everyone thought. The race times started showing up on the scoreboard. Next to Kampf, the time was 1 minute, 31.72 seconds. Smoot did remember her time. It had flashed on the scoreboard less than five minutes ago, and the 1 minute, 31.59 seconds was the best she had ever run for 600 meters. She couldn’t have remembered it incorrectly, could she? “One-thirty-one-fifty-nine is what I ran,” she told her mom. “What is happening?” Smoot said. What was happening was this: As the roar of the crowd died down in the aftermath of one of the most amazing races a Big Ten crowd had ever seen, Audrey, Mark, and Diane Smoot knew something that no one else did. At most track meets, there is a results wall. It’s often under the bleachers or next to a bathroom in a gym, and it’s the place where sheets of printed out results in Courier New font are taped to the wall, kind of like an F.B.I. crime board, but without all the connecting strings. That day in Minneapolis, Smoot walked over to the results board to see if her crazy hunch was right—to see if she had somehow won the 600 from the slow heat. Smoot’s memory of the medal stand is the same as Kampf’s. “Ohhhh,” Kampf said, her eyes wide. She congratulated Smoot and moved behind the silver-medal spot of the podium, telling Dittmar to move into the third place spot on the podium. Smoot says Kampf was a fantastic sport about it. The Minnesota fans weren’t exactly sure what to do when it was announced that Kampf had finished second. But it was those eight points that made the difference—it was the greatest second-place finish ever. For Smoot, meanwhile, it is the story she gets to tell whenever the video shows up on Twitter or Instagram or Facebook like it does so much. She loves the story, and smiles whenever she tells it—and she’s okay with the fact that her side of it might not be remembered as much. She loves saying that she had a good feeling about the weekend, and that her goal was simply to make the final. She loves saying that it was “the highlight” of her track life. She had never won state in high school, had never even come close to winning a Big Ten title. But on that day, she did, and it’s something she will always cherish. She always adds one extra part to her story, just to make sure that whoever she is telling knows there is always more than one story to every race. The moment Audrey Smoot realized she had, in fact, won the Big Ten title in the 600 meters at the 2008 Big Ten Indoor Track and Field Championships. Did you enjoy this story? To read other articles on LØPE Magazine requires a subscription. For $20 per year, you will get access to one eye-opening story per month; and hopefully more.